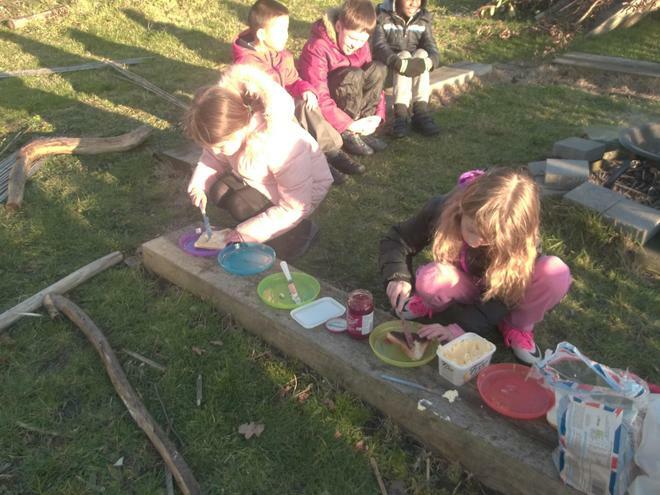 Today the children cooked hot dogs or toast. 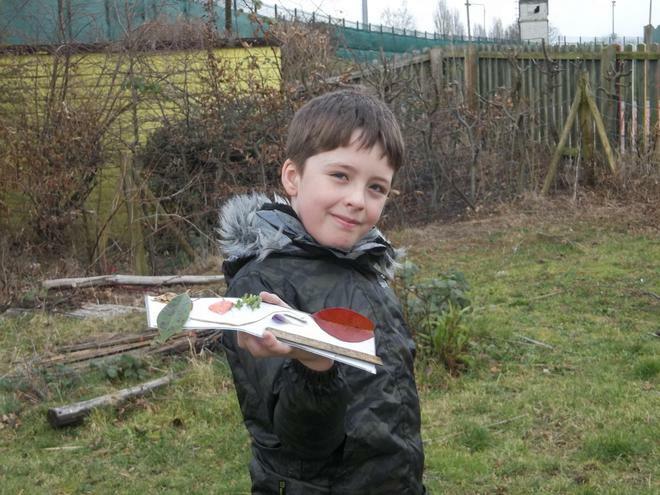 They also made a colour palette or bracelet using natural materials. 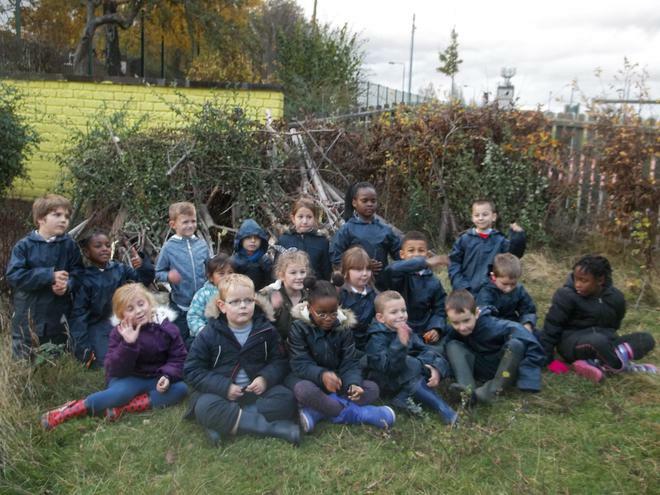 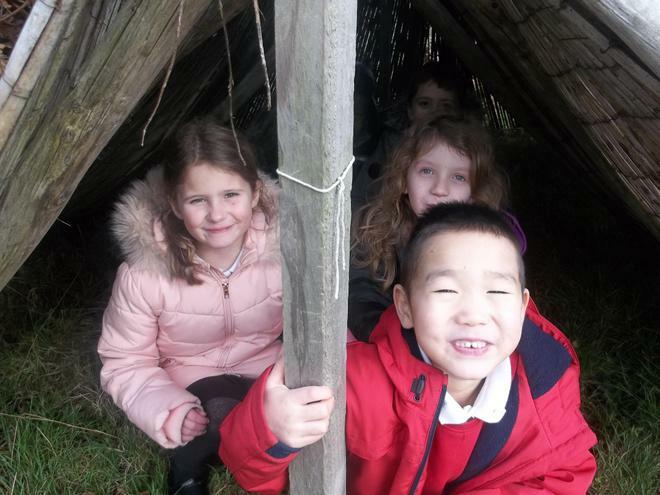 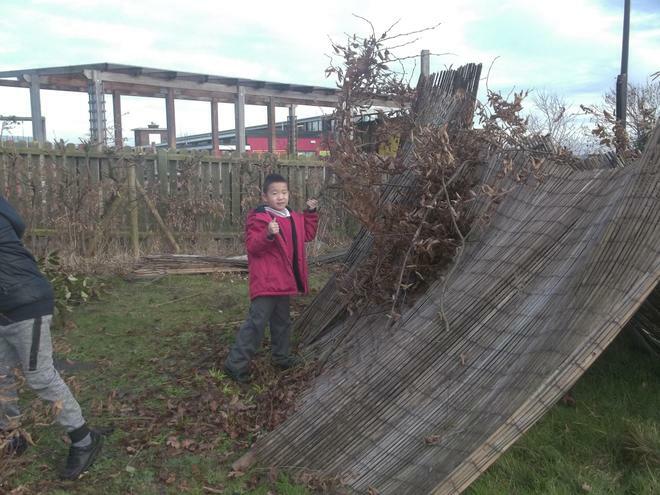 Today the children made a den using the natural materials that they could find in the forest school area. 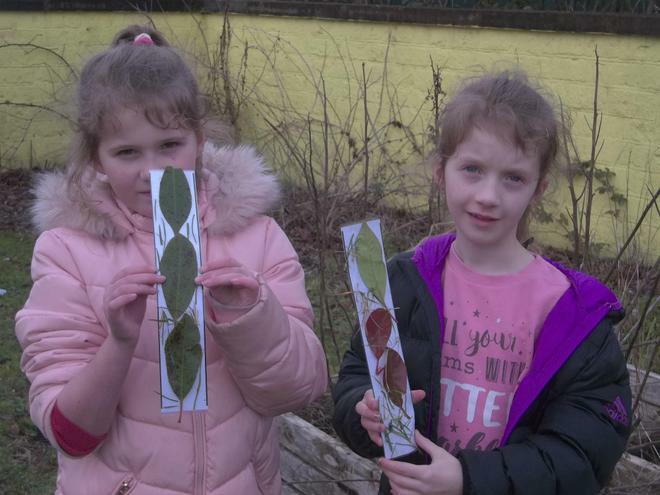 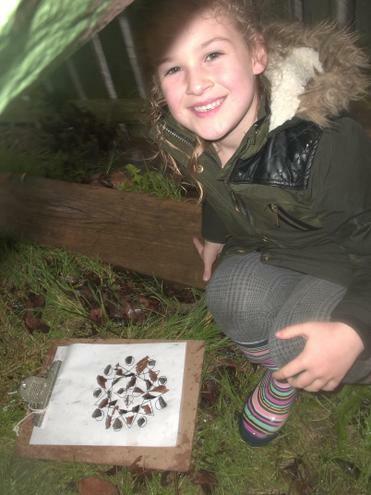 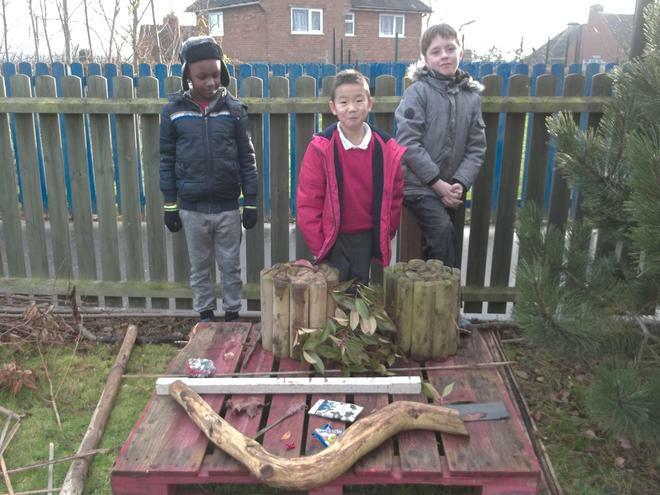 The children went off individually to find five different natural objects, then they worked in groups to create a piece of art using the five things they each had found. 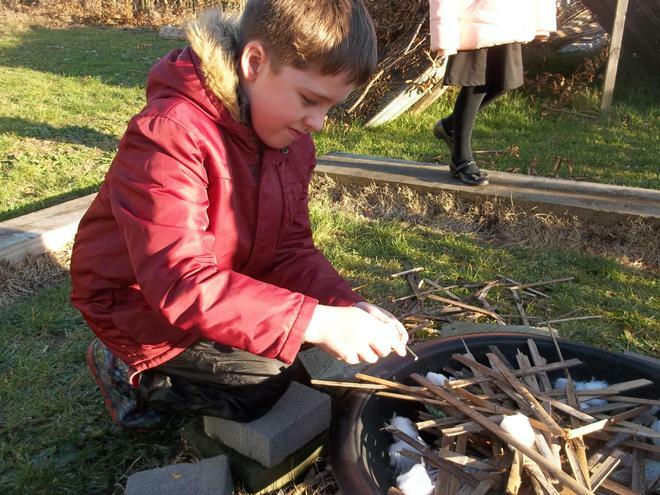 Today the children learnt how to light a fire using paper, wood, cotton wool, Vaseline and a fire strike. 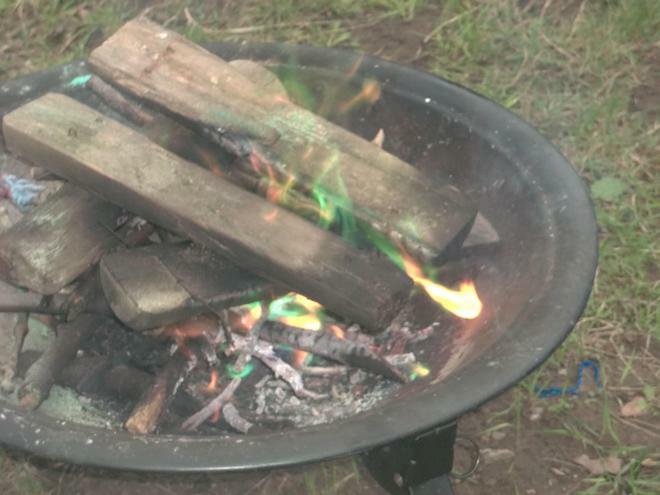 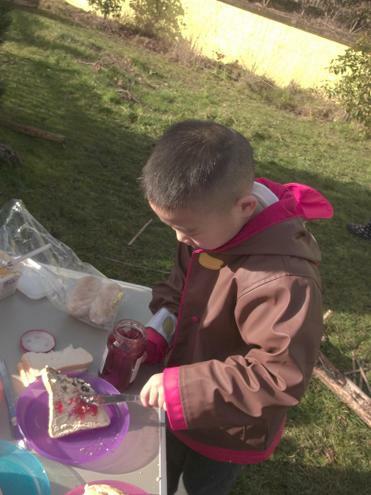 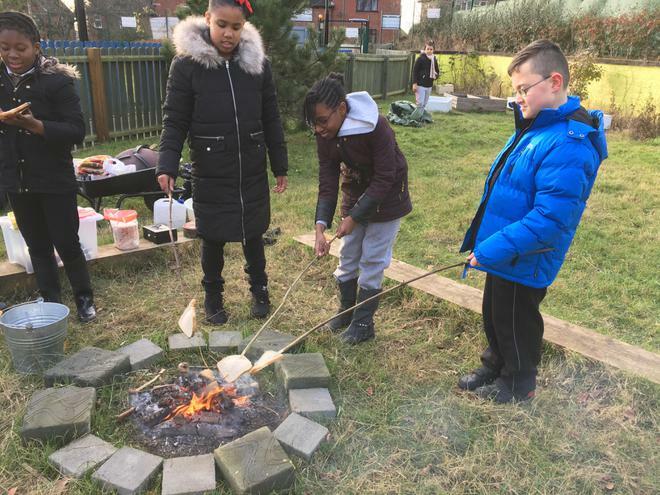 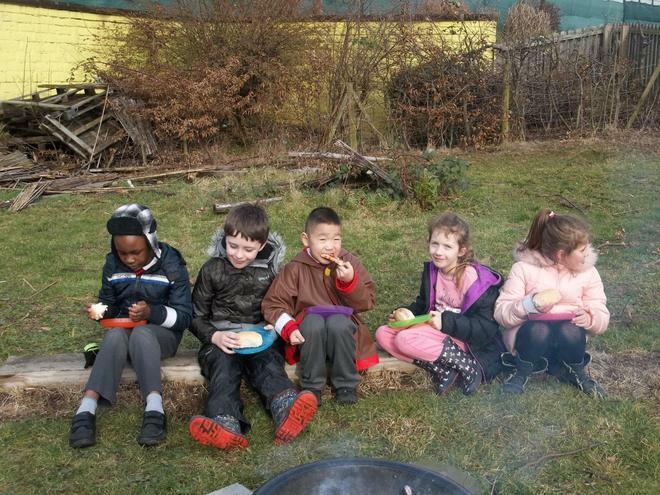 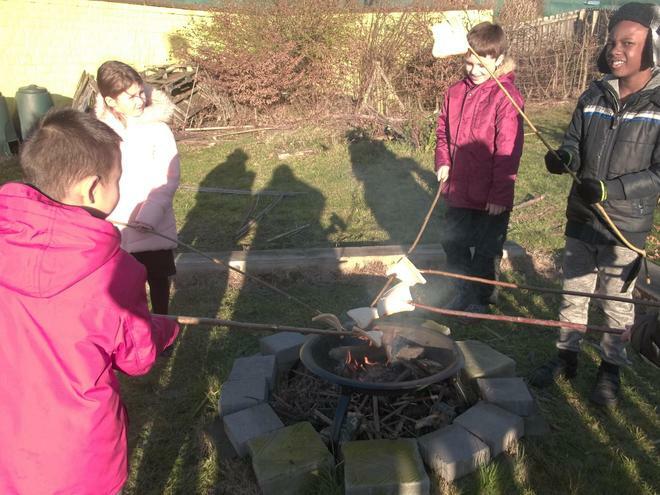 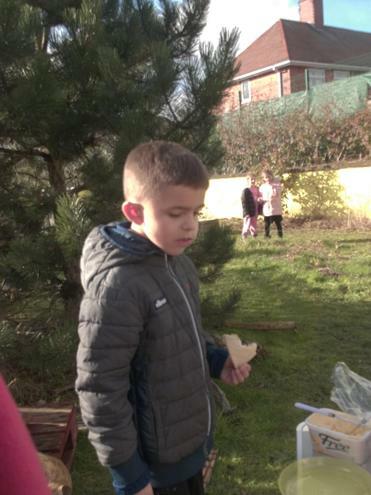 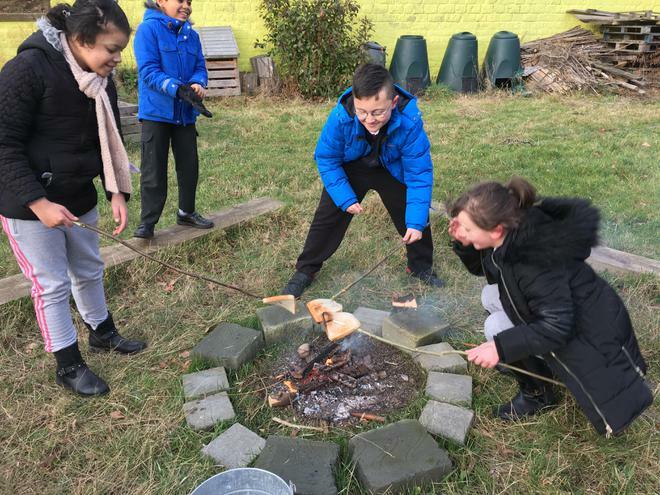 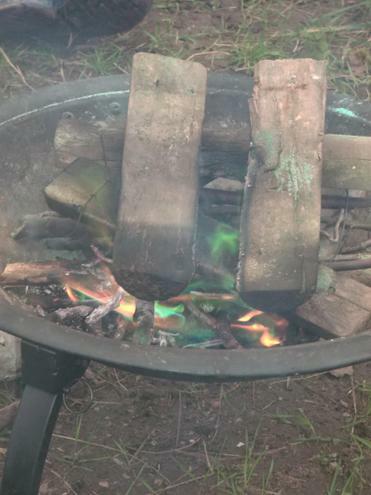 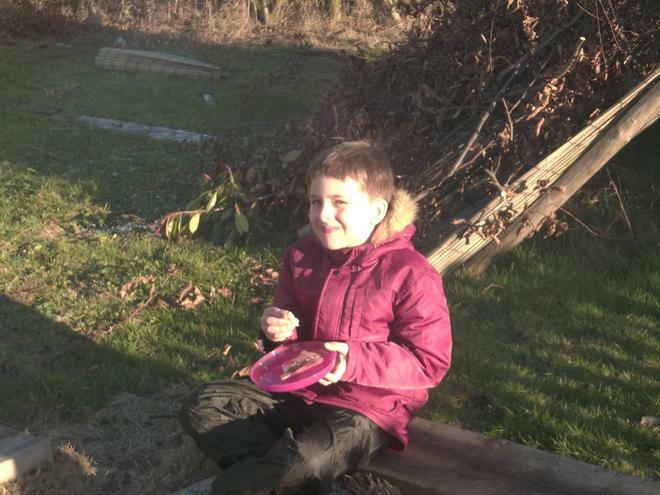 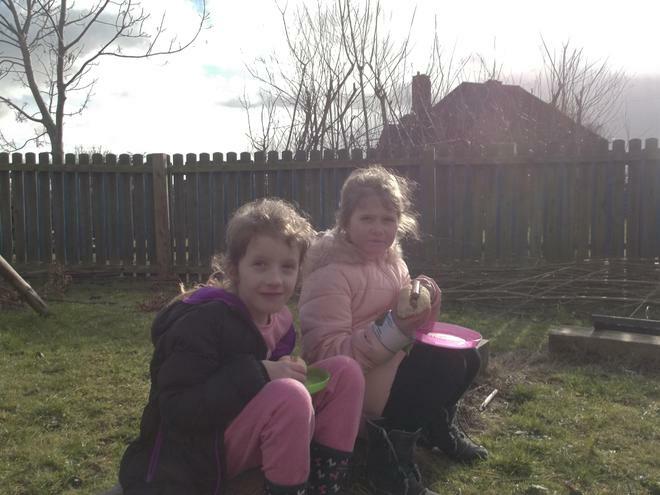 once the fire was lit and burning well the children cooked some toast, spread their own butter and jam..
During the spring term we will be looking at lighting a fire to cook toast, marshmallows and hot dogs. 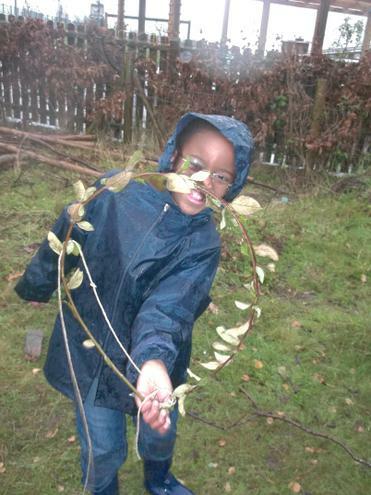 We will also be doing some weaving and art using natural materials. 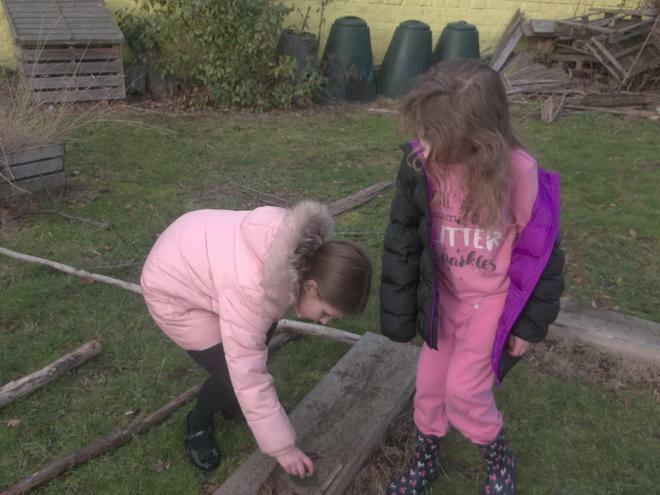 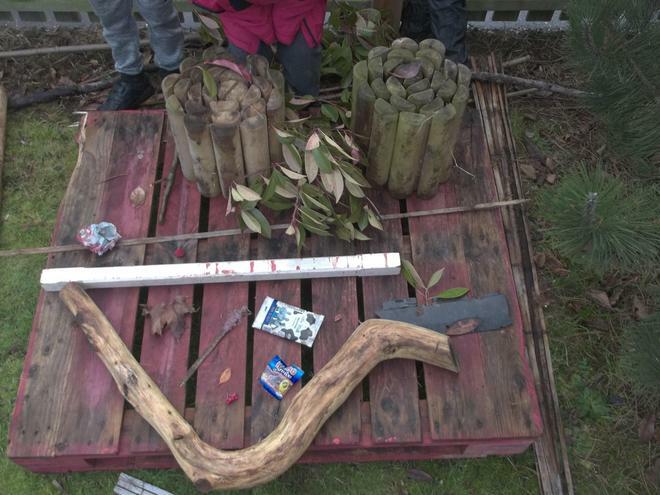 In the first session a group of Year 2 children have been learning about the tools we will be using in forest school and how to use and carry them safely. 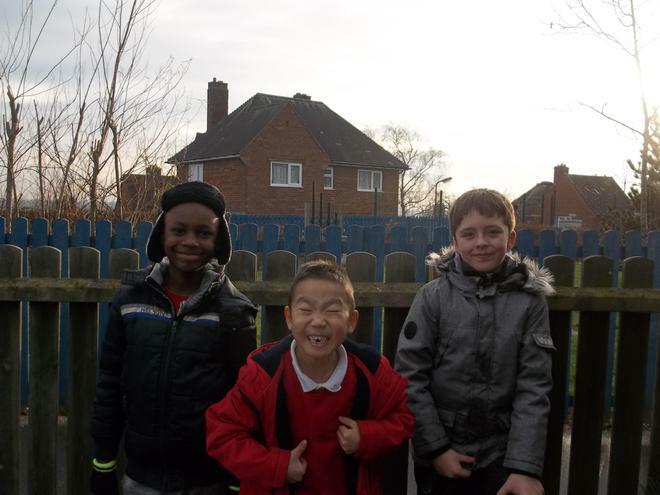 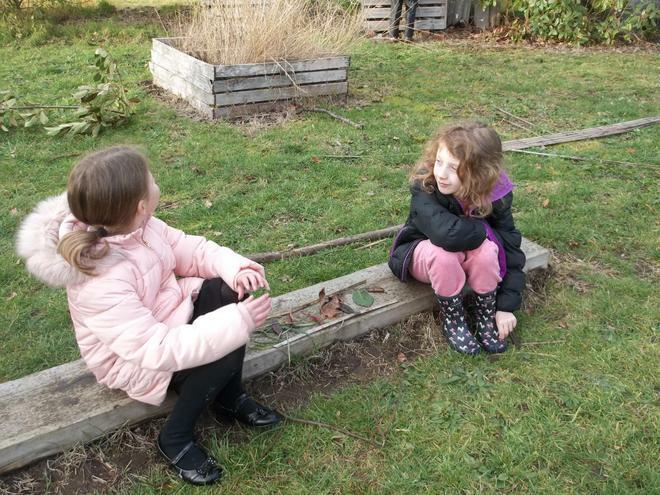 We talked about what they thought Forest school was and what they would like to do. 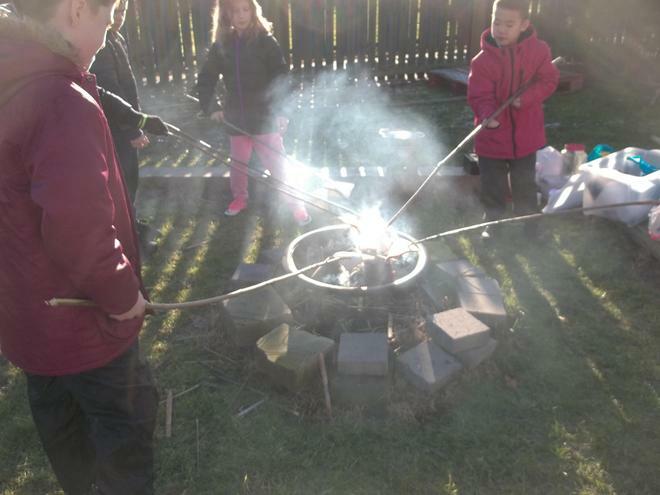 In the second session we discussed how to light a fire and the purpose for lighting the fire. 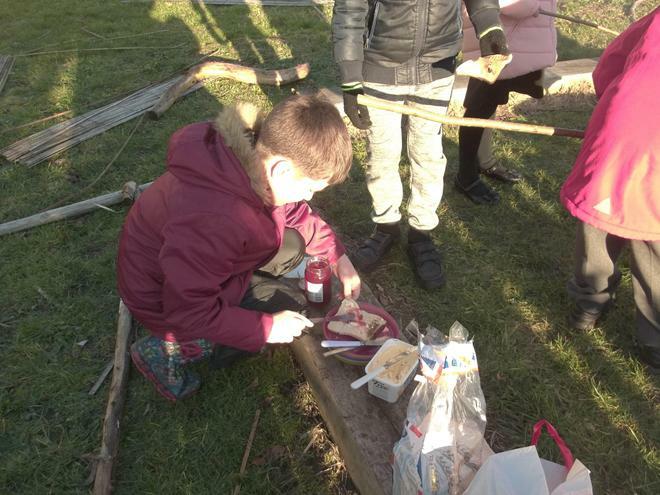 The children learnt that they needed paper, cotton wool, Vaseline and a flint and steel. 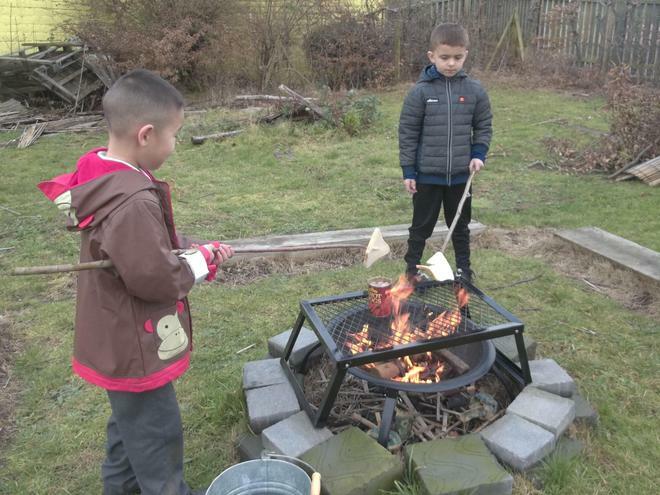 They were resilient in trying to light the fire and were eventually successful. 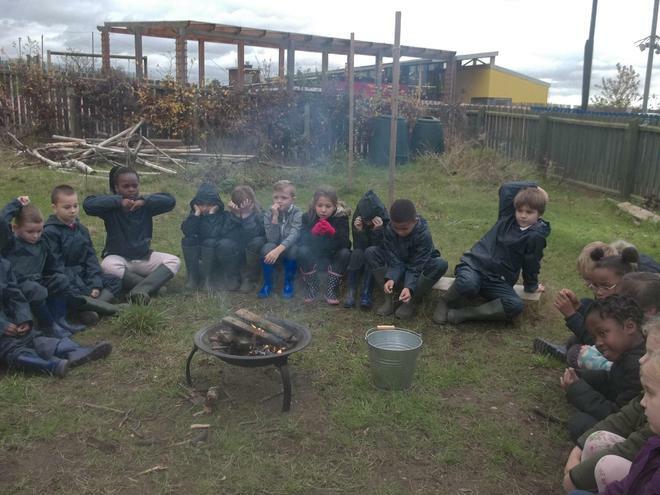 In our third session the children lit a fire reviewing what they had learnt the week before. 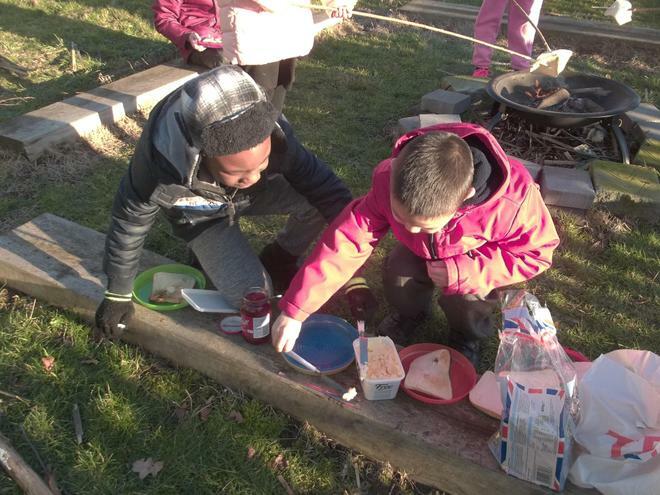 The children cooked toast on the fire and spread it themselves with butter. 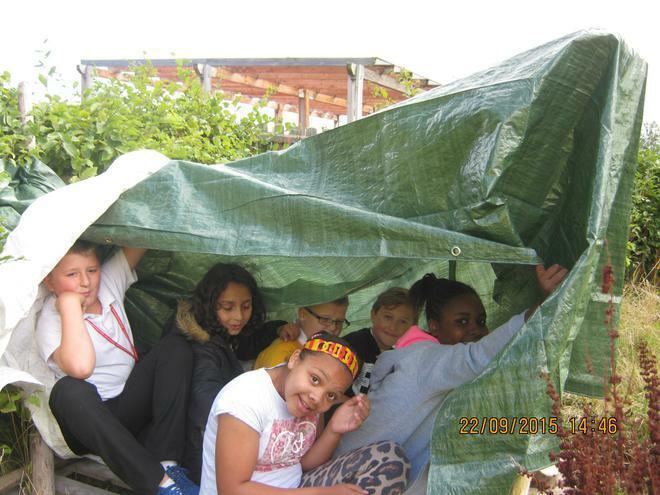 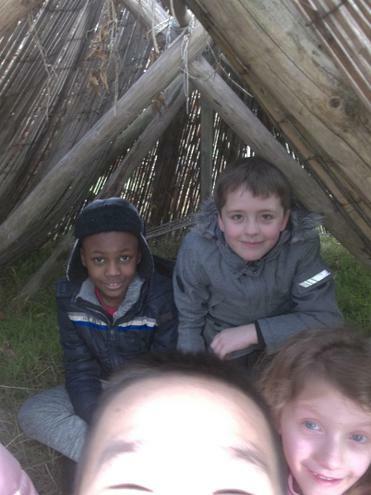 We have been doing den building over these two weeks, learning various knots and why we may need to camoflauge the den. 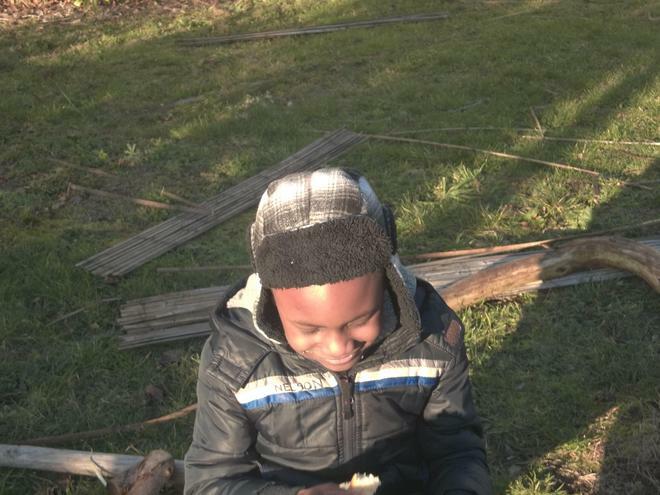 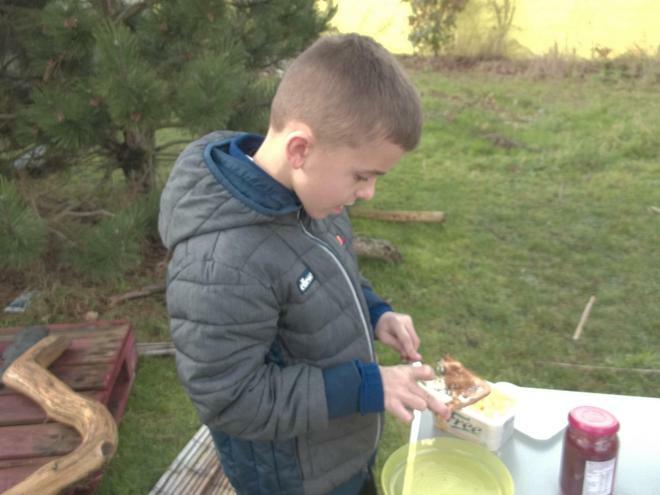 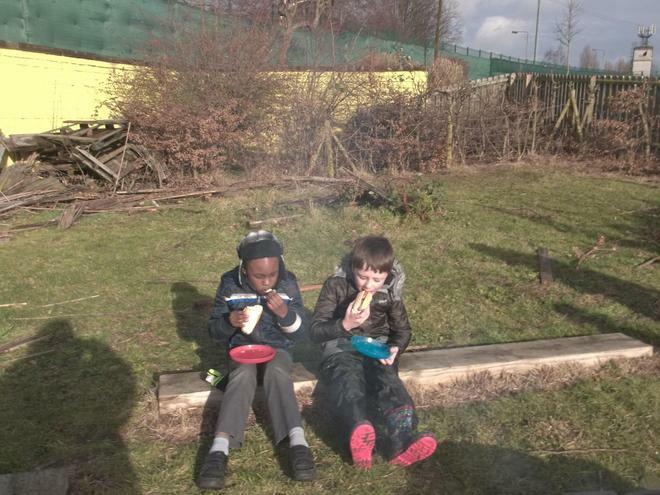 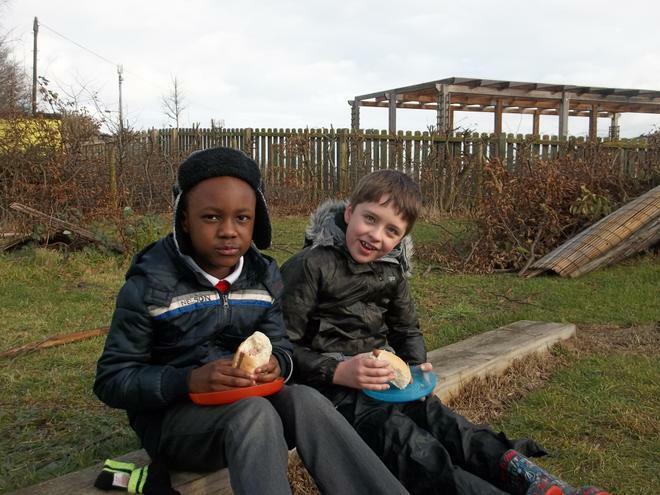 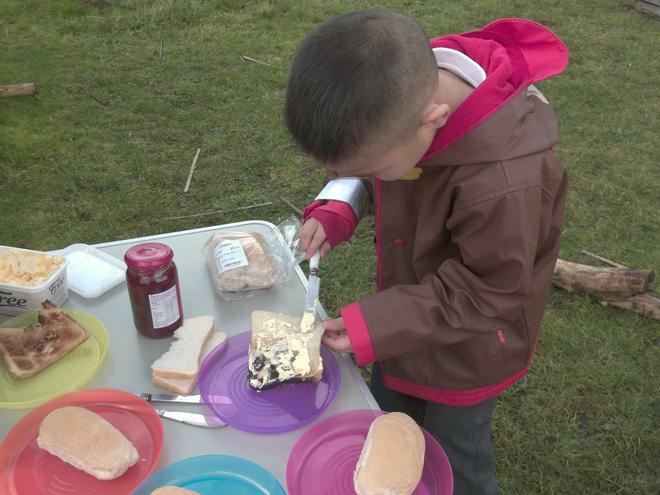 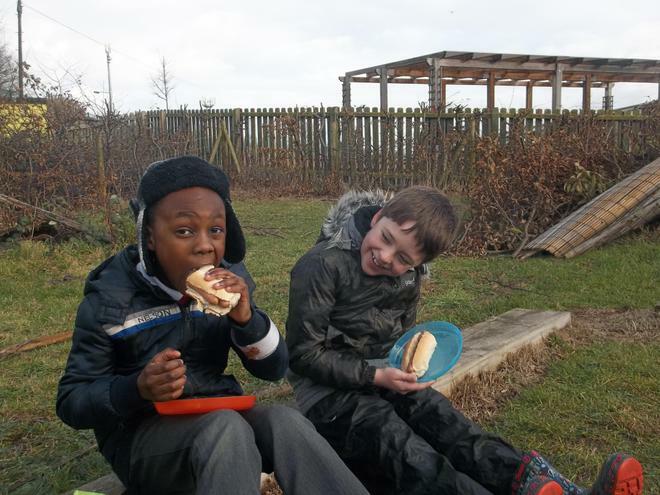 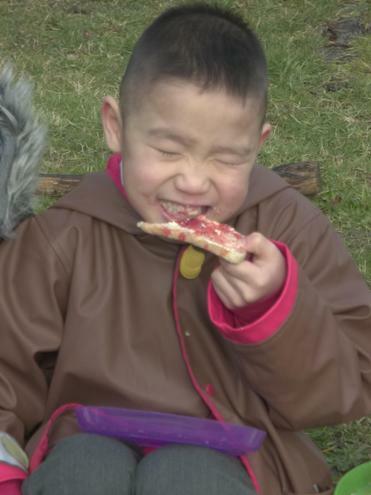 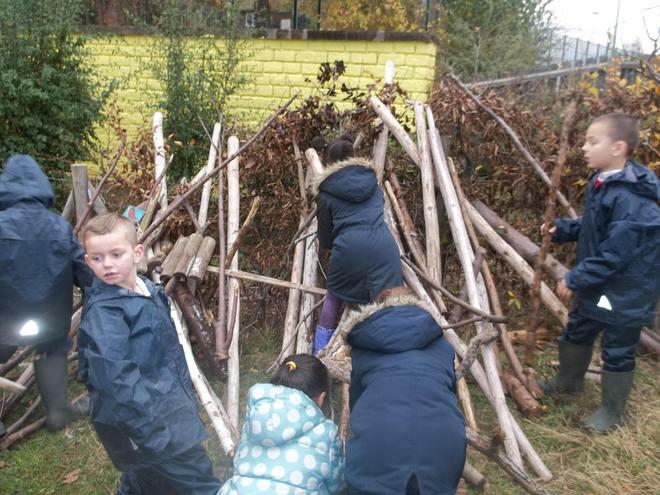 This year in Forest school we have been building dens, lighting fires and cooking toast, marshmallows and hot dogs. 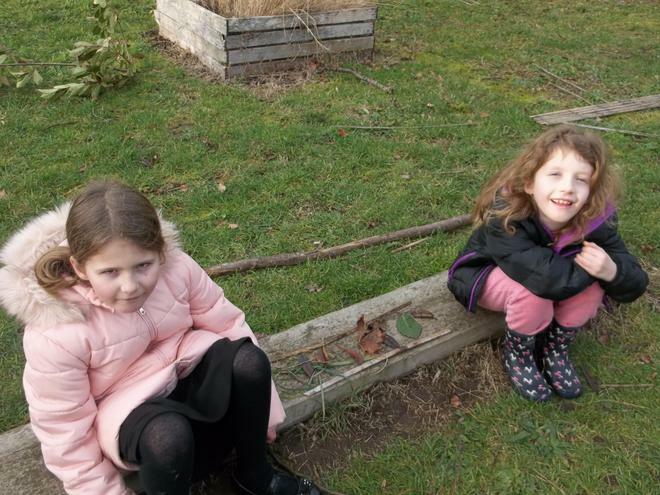 We have also looked at mini beasts and willow weaving. 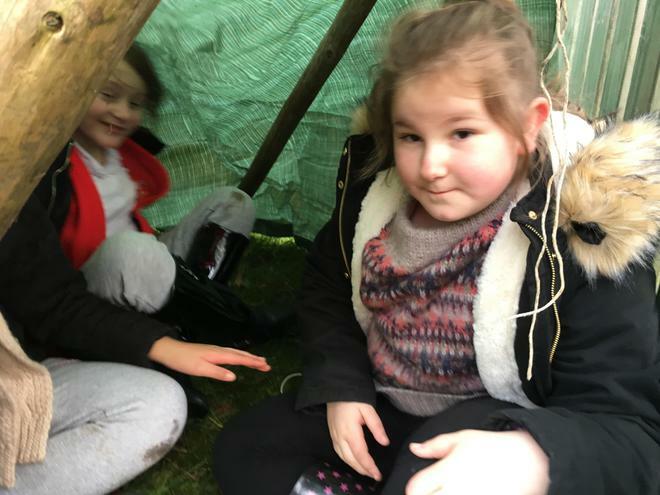 Welcome to Forest Schools September 2017. 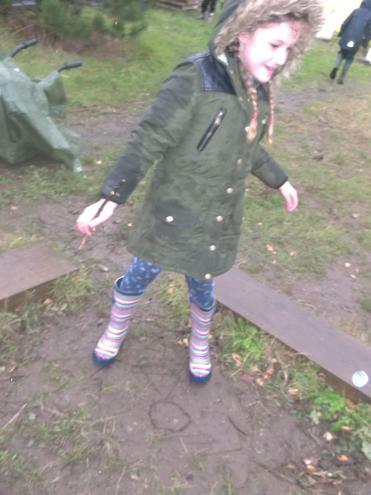 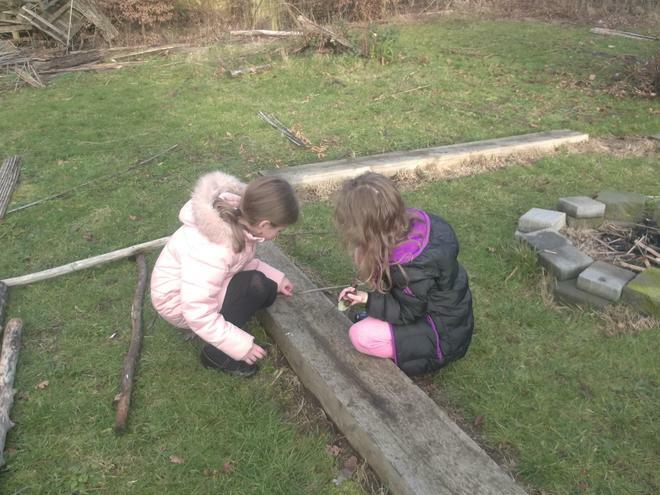 So far Year two have used their Forest School skills on their residential at Sherwood Forest. 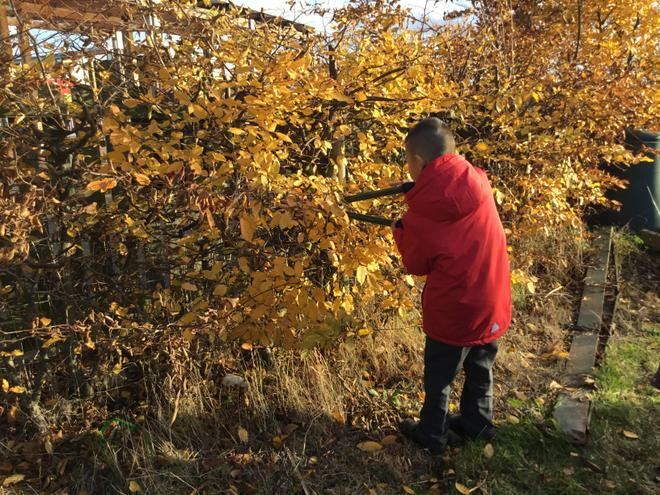 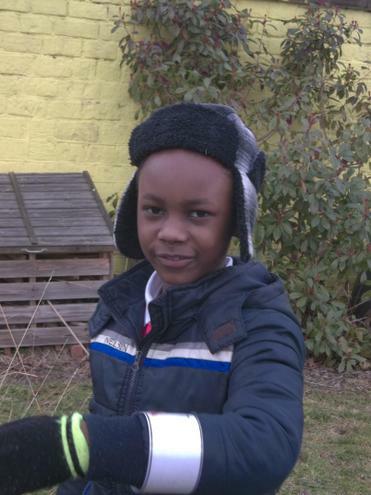 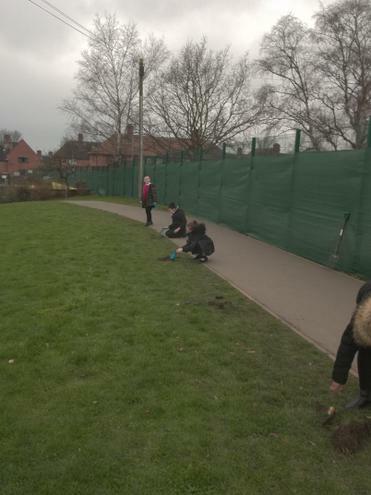 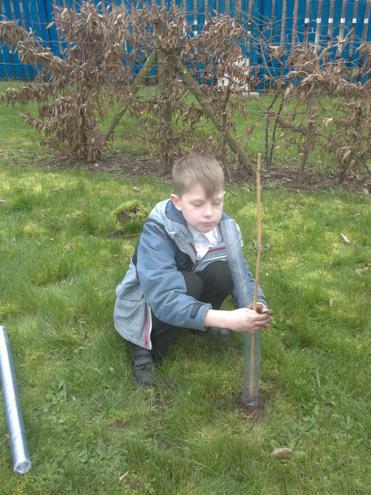 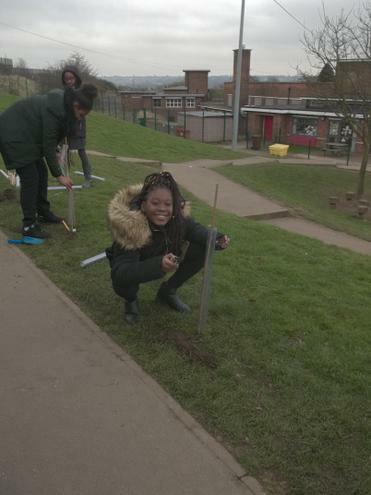 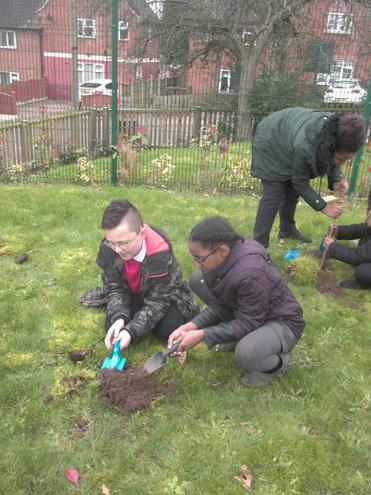 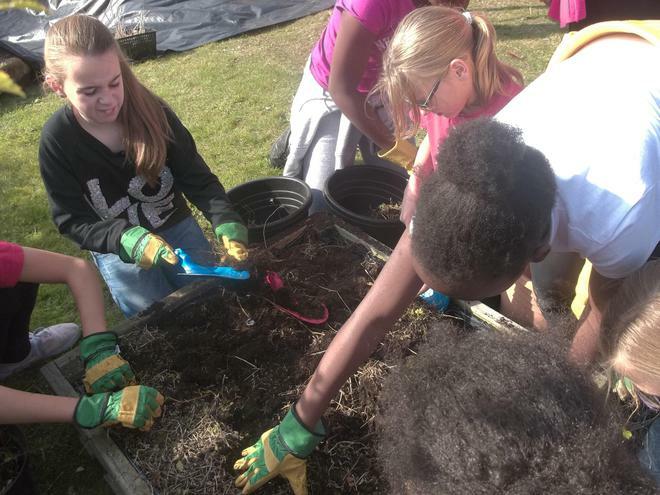 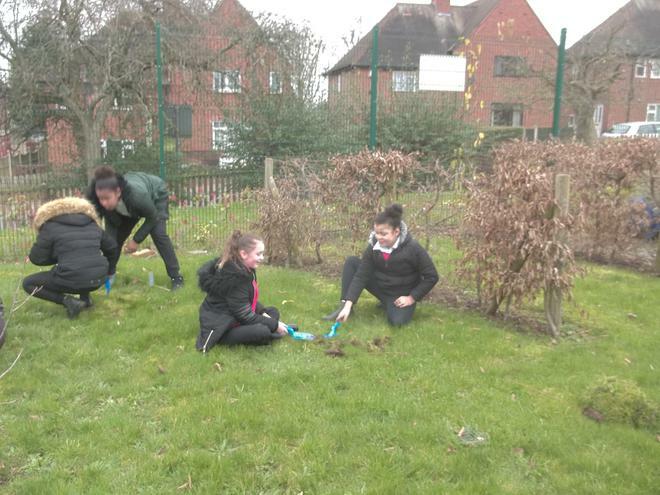 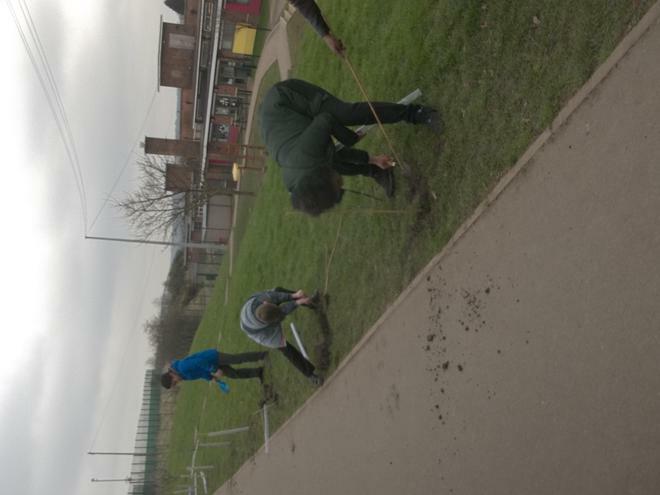 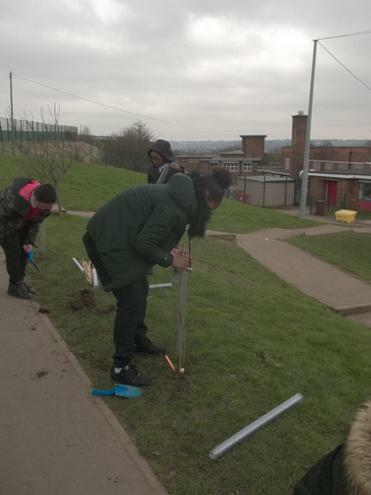 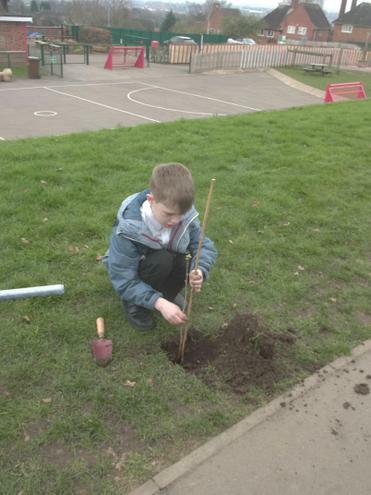 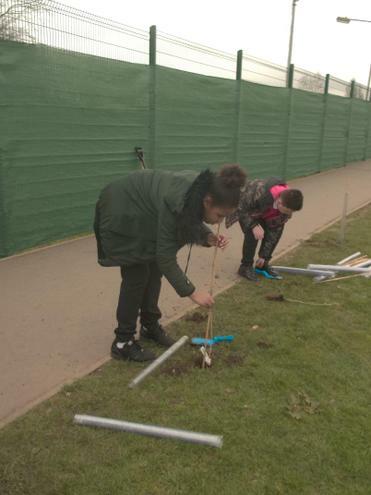 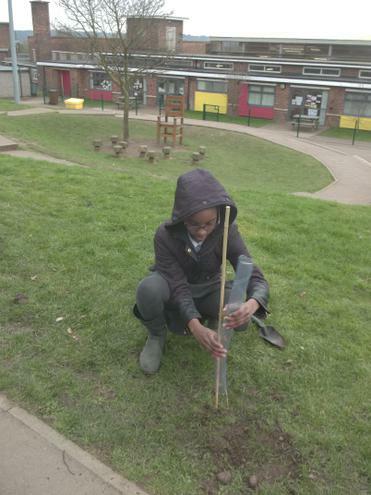 Today the children planted trees along the grass at the top of the playground and in the nature garden. 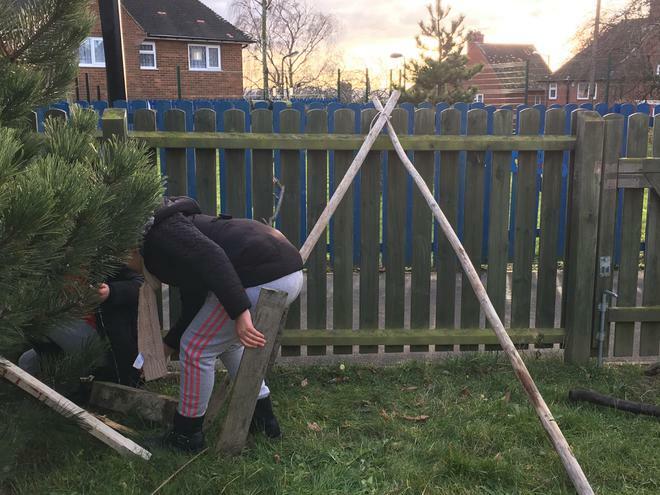 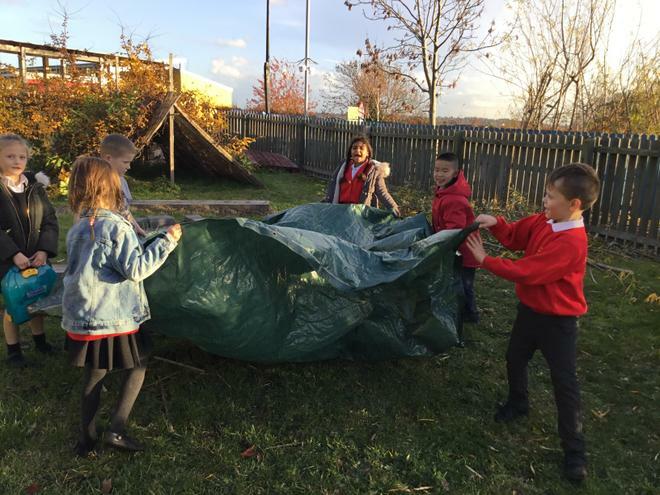 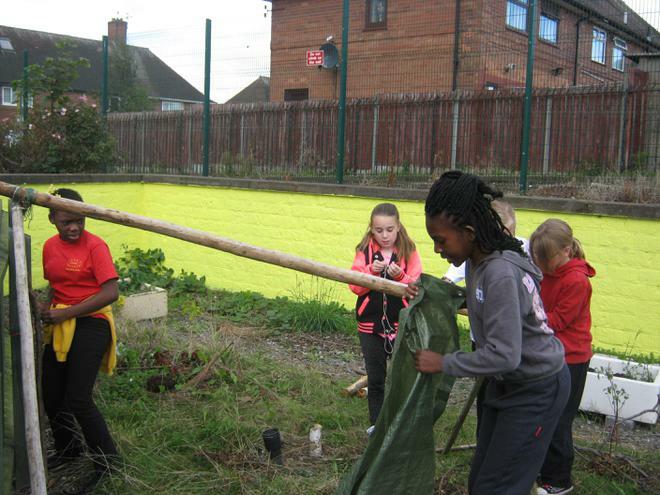 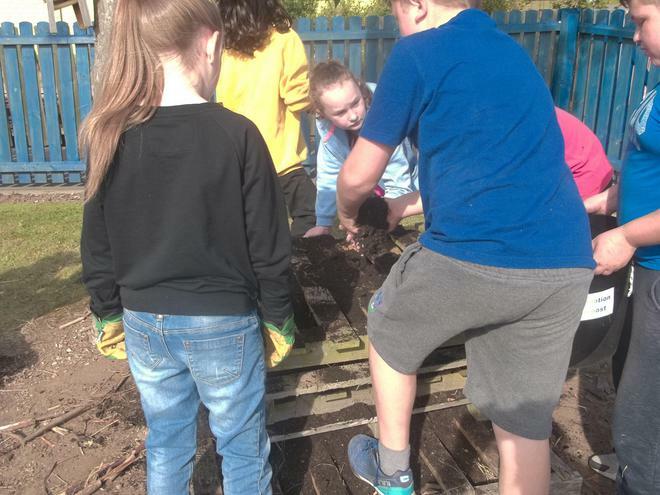 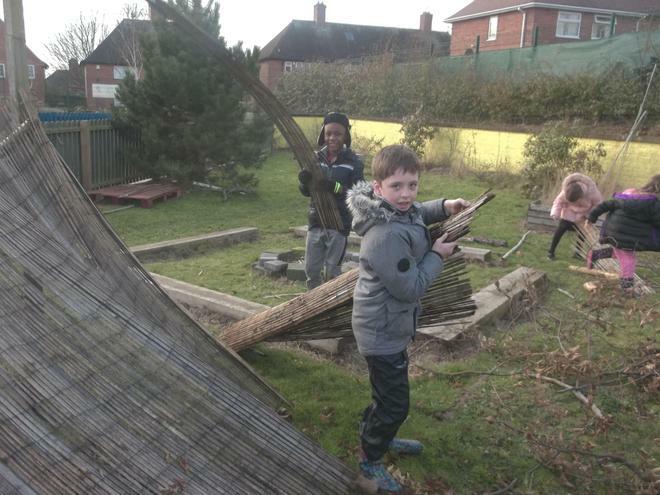 This term a group of Year 4 and 5 children are working outside on alternate Fridays developing their skills in areas such as team work. 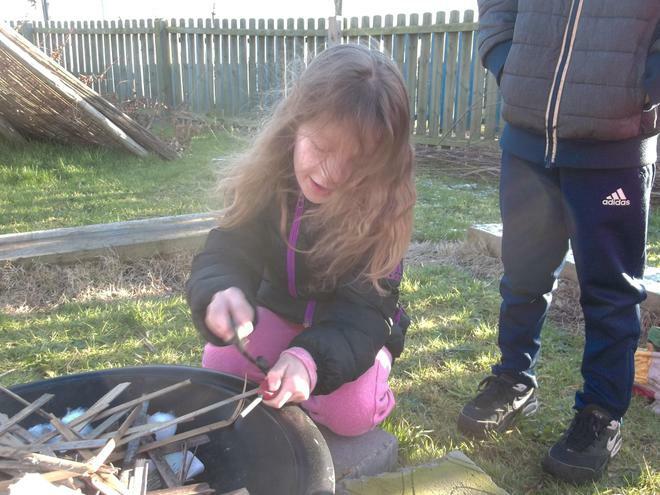 The first session involved fire lighting and making toast. 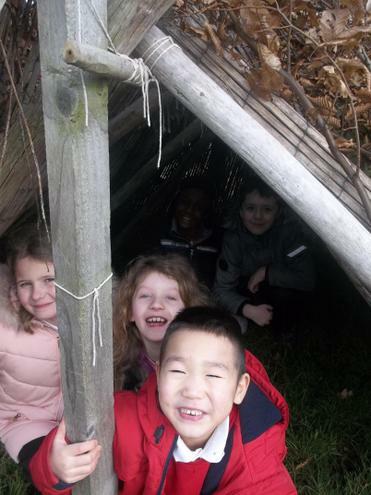 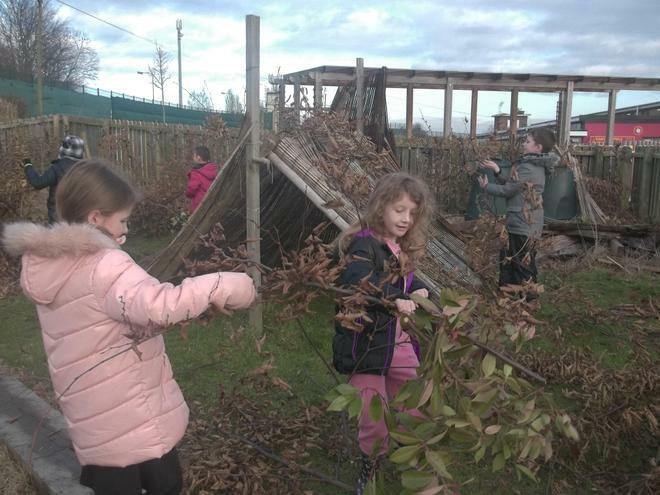 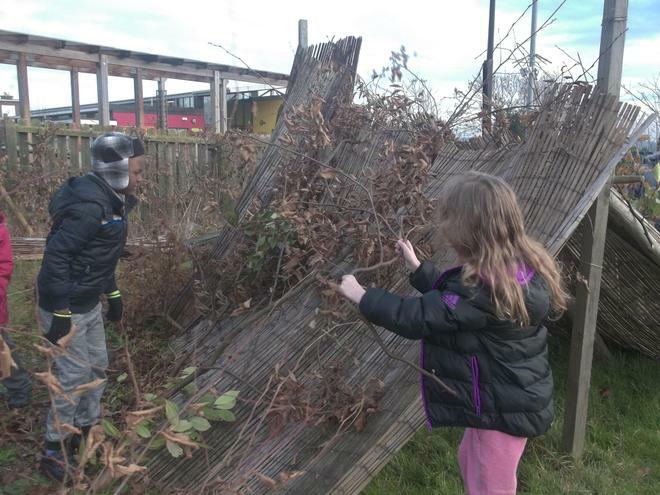 They worked in small groups to make dens using natural materials they found in the Forest school area. 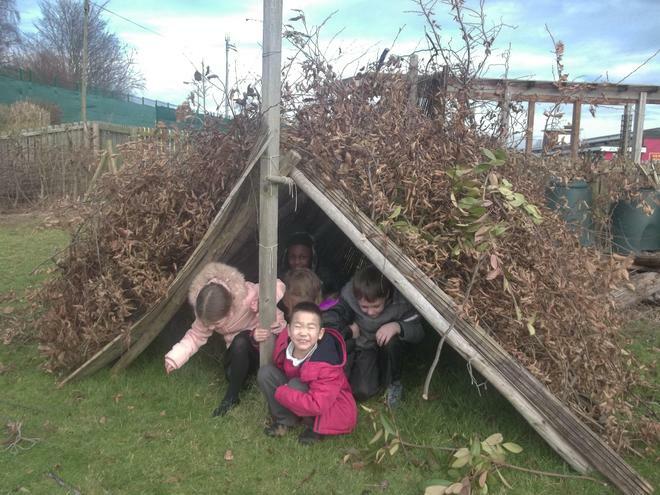 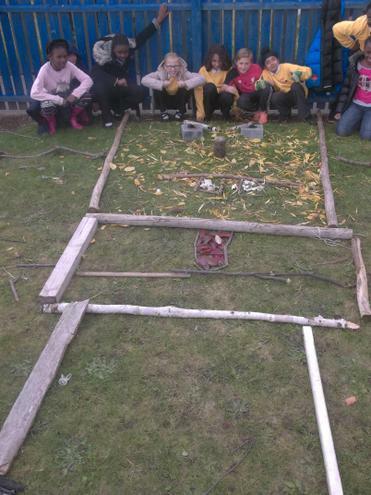 Each group worked together to build the most effective den that would survive the 'water' test. 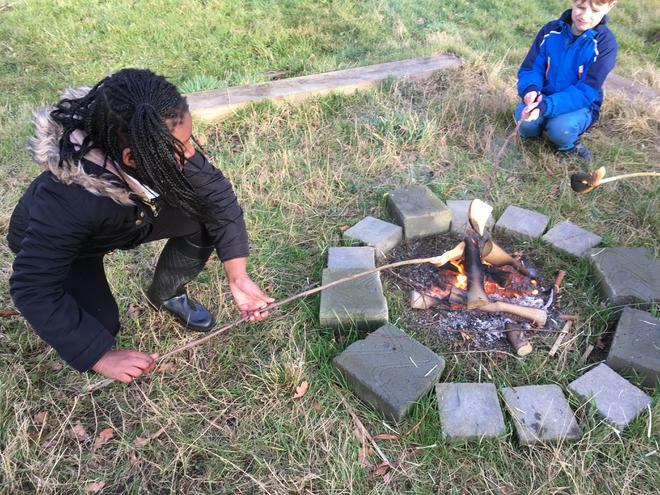 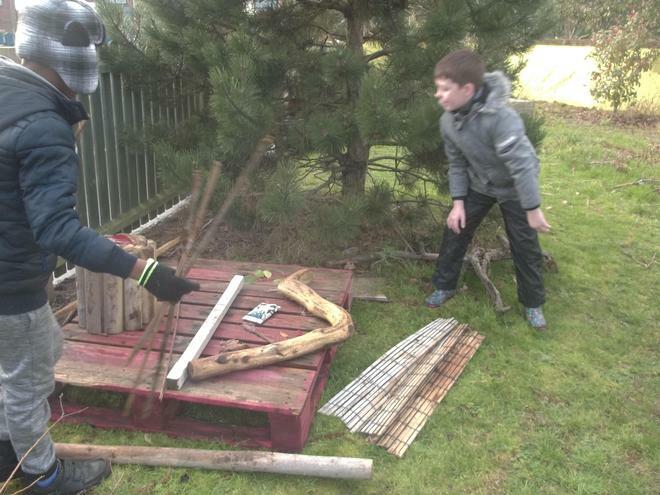 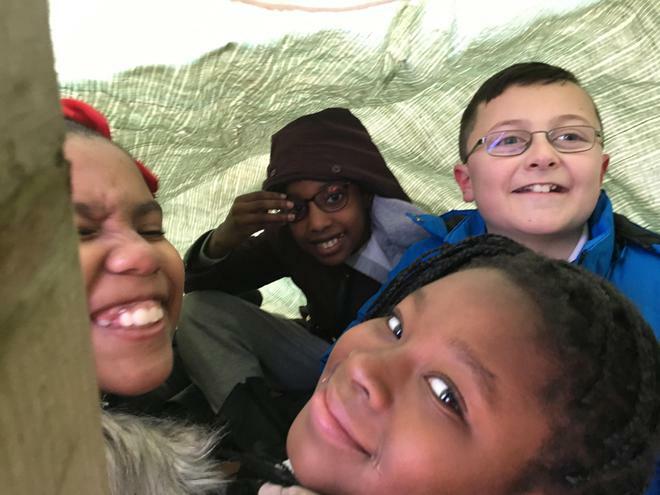 This autumn term a small group of Year 5 and 6 children will be working outside in the forest school area to develop team building, problem solving and communication skills. 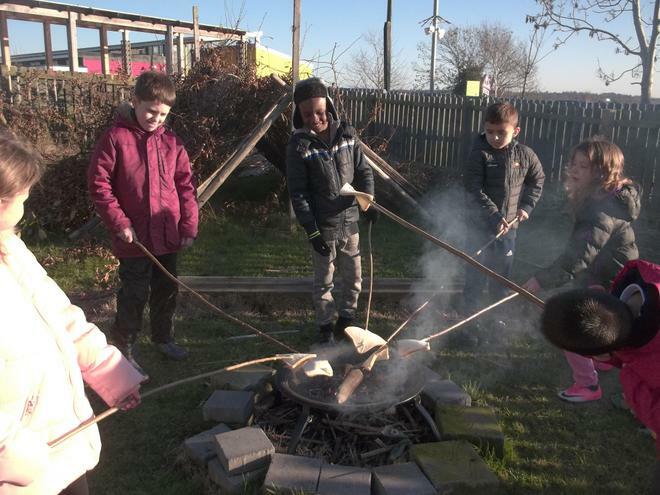 we will be trying a arrange of skills such as knot tying, den building and cooking on the fire. 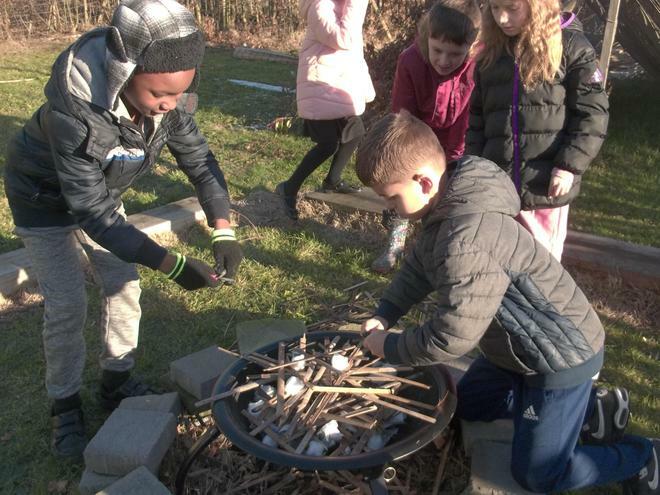 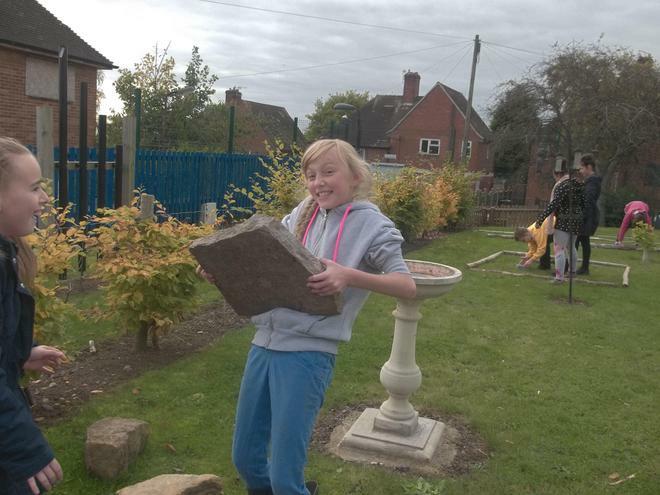 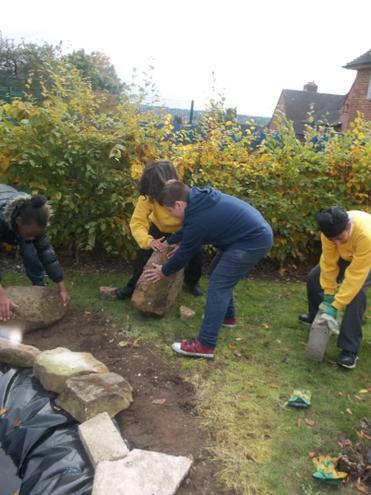 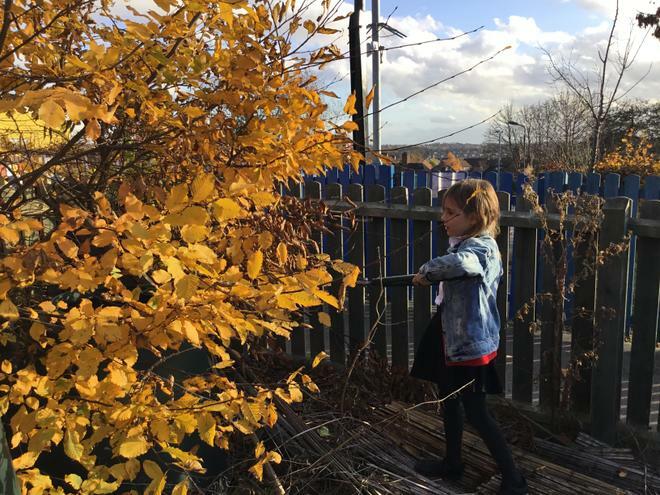 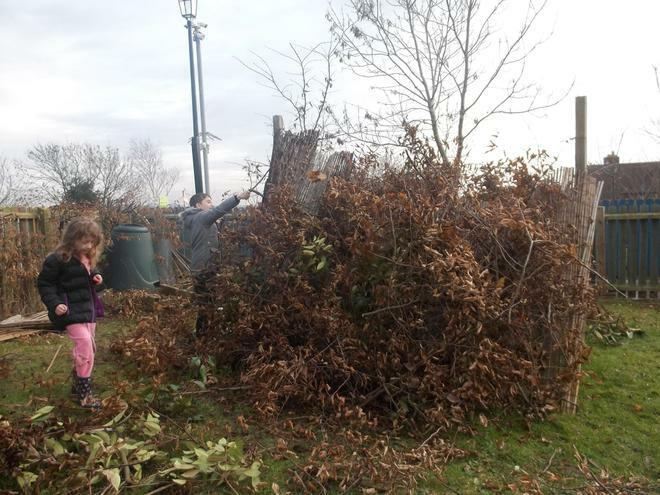 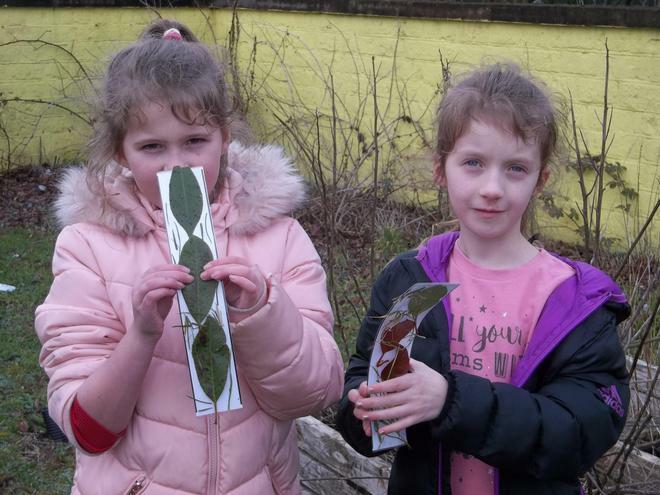 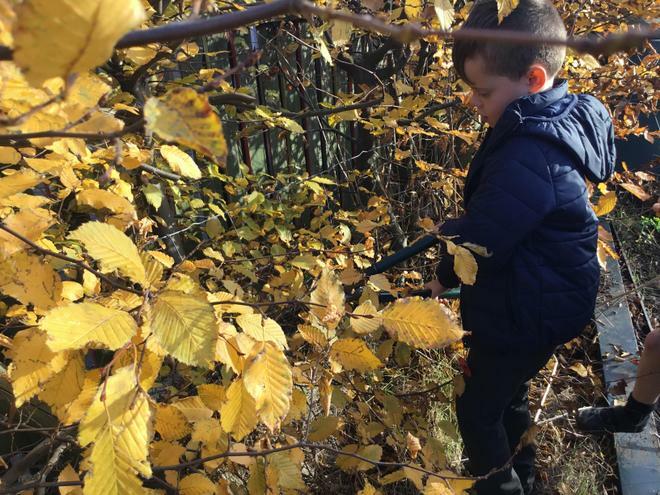 We will also be looking at habitats within the school grounds, growing some vegetables to cook on the fire, art using natural materials in the environment and many more activities. 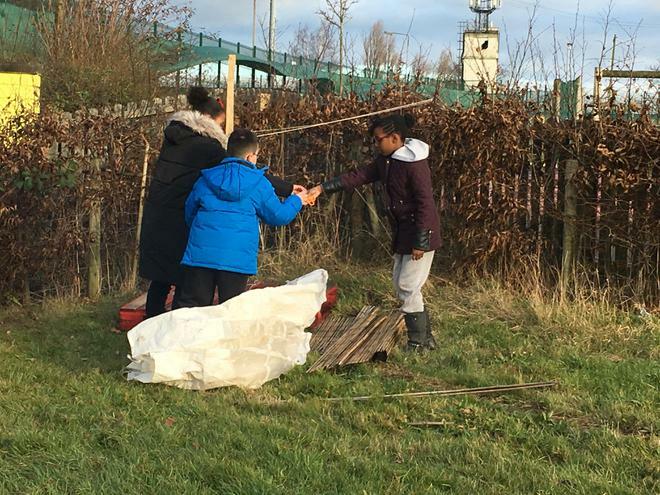 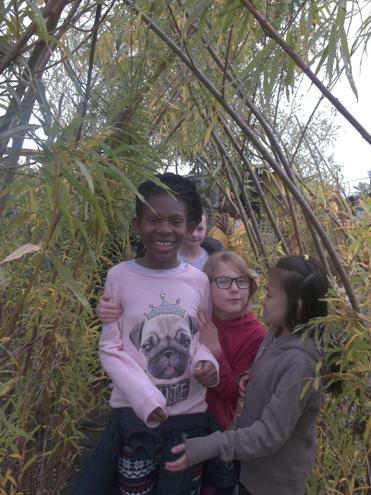 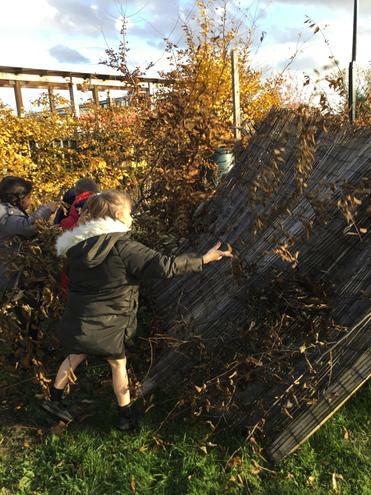 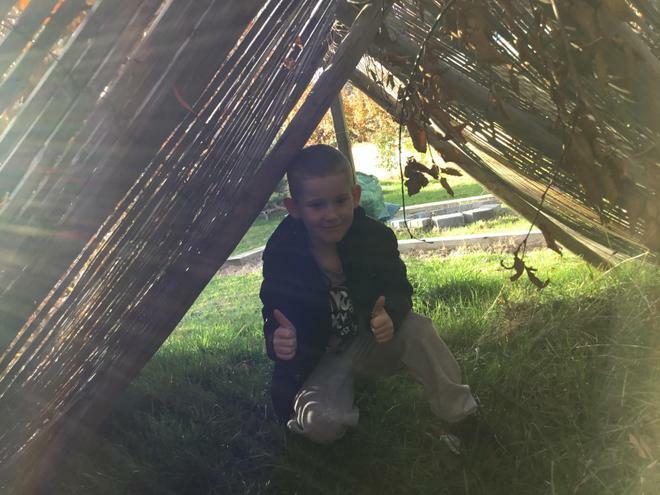 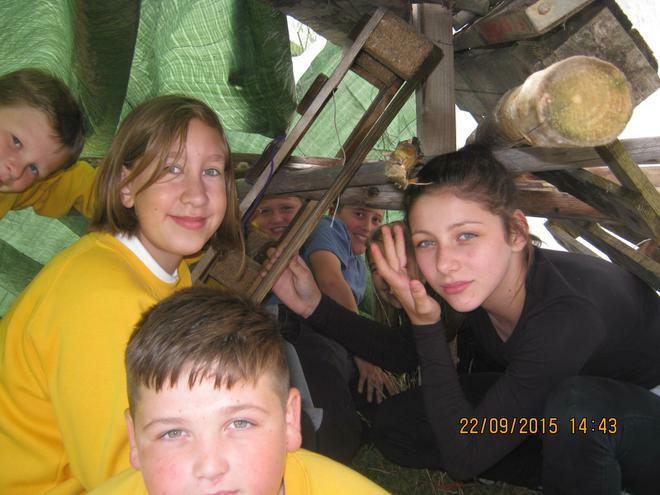 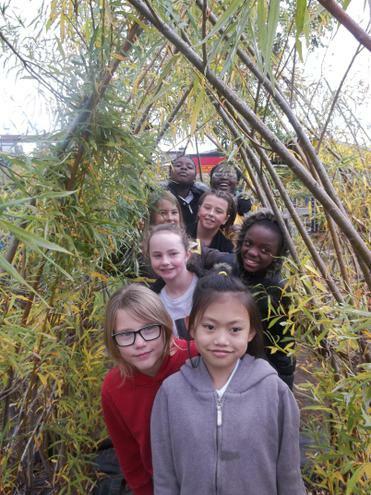 During the Autumn term, Year 6 sampled den building, fun in the willow dome, Art using natural resources found in the outdoor learning area. 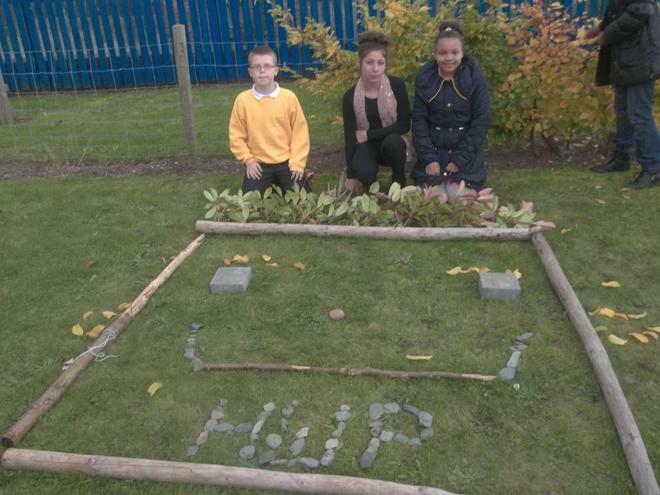 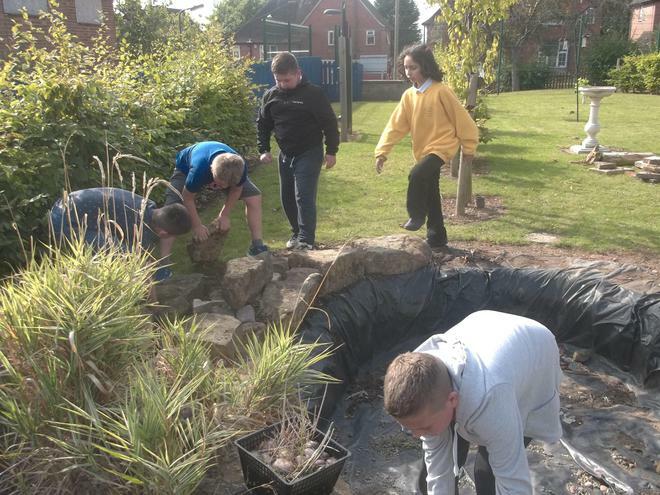 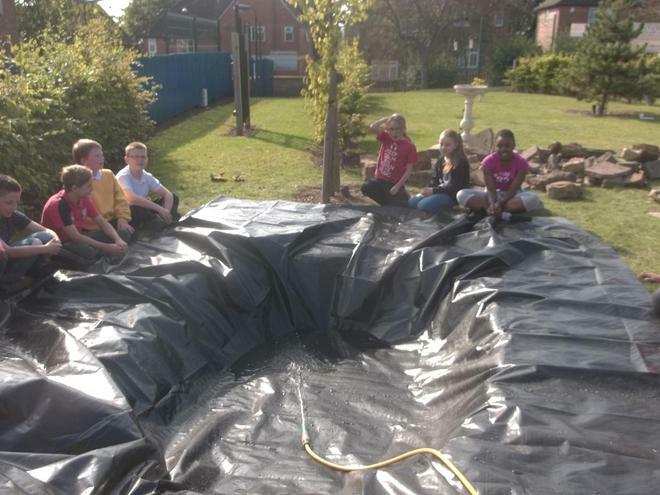 They also repaired and reconstructed the mini-beast mansion and relined the pond to encourage insects and pond life. 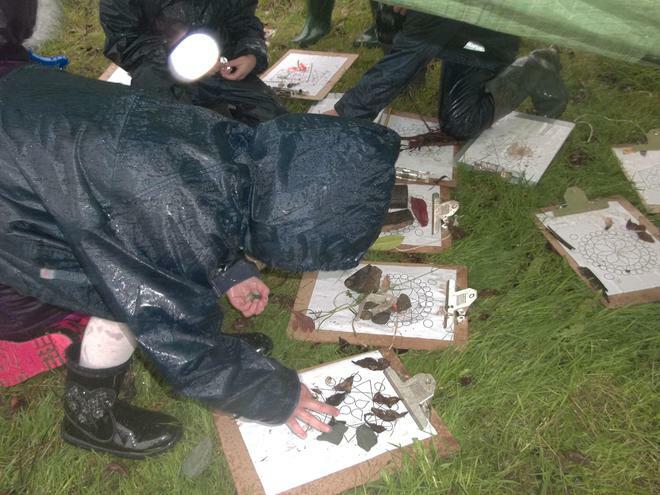 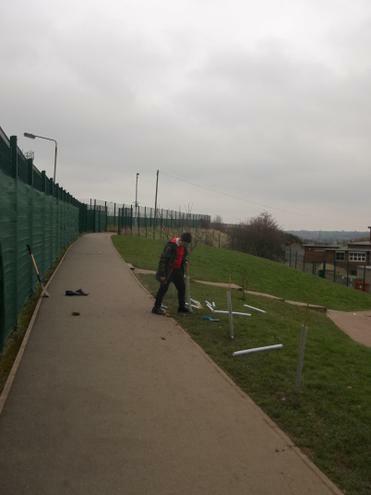 this will enable the children to do science outdoors, looking at mini beasts, life cycles etc. 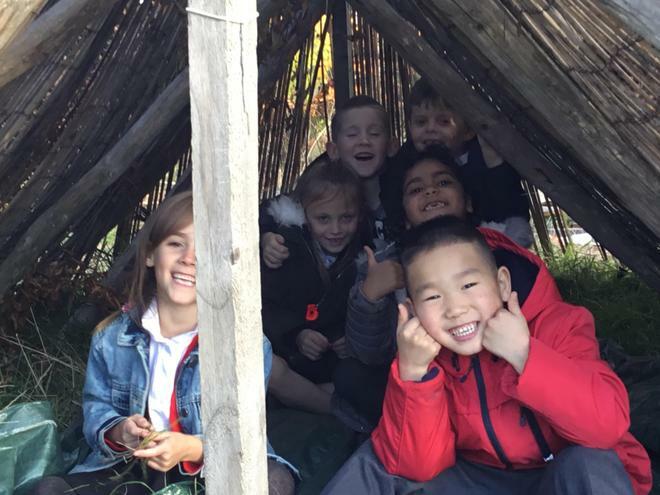 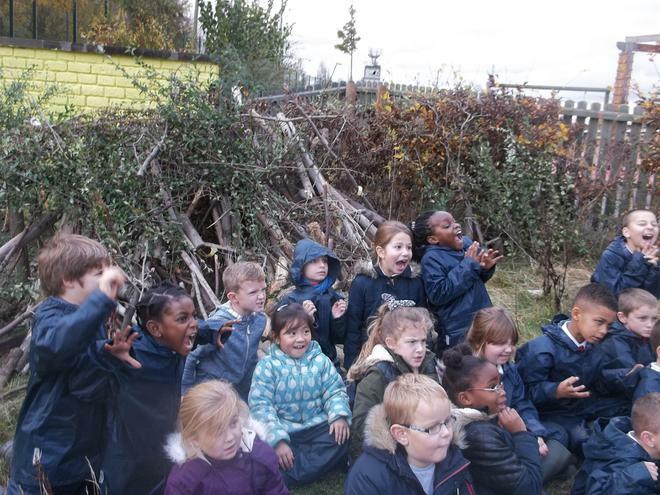 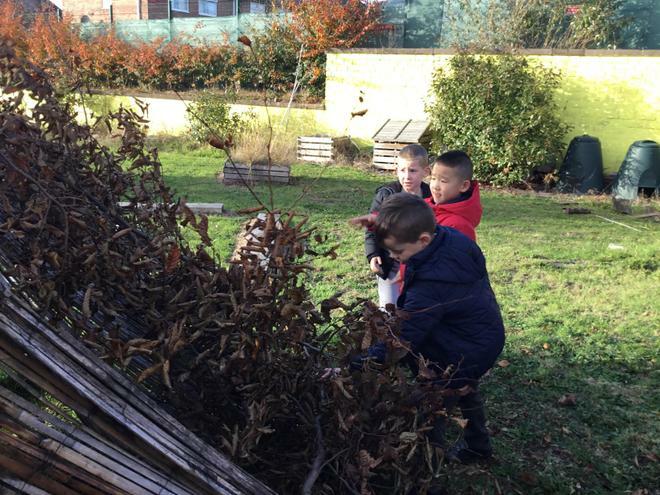 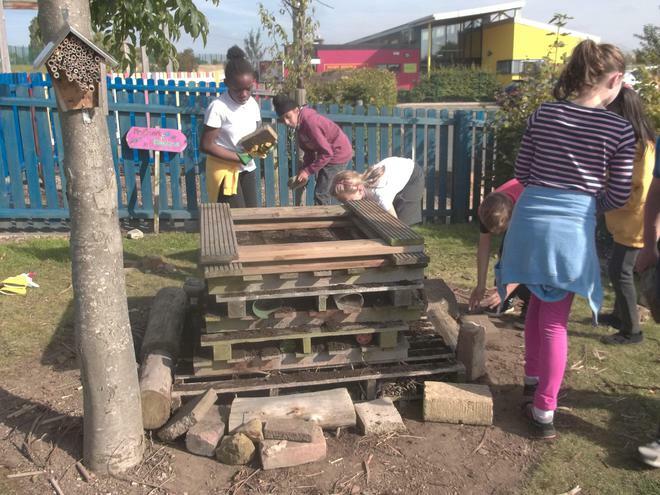 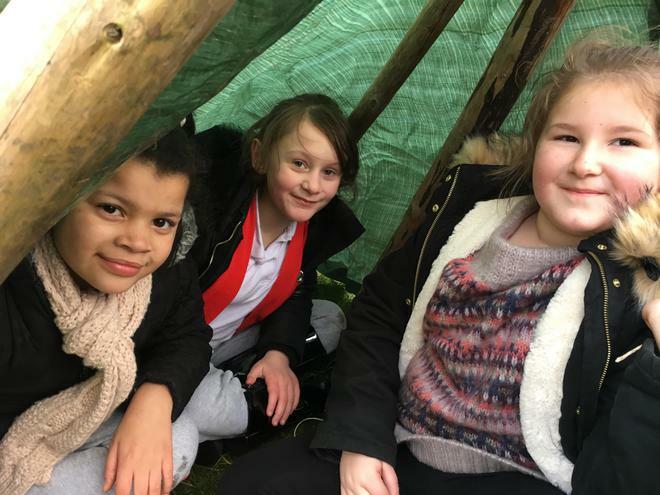 Year 2 have enjoyed telling stories of ghosts around the mystical fire, they built a den for the ghost to live in this linked with their work in Literacy. 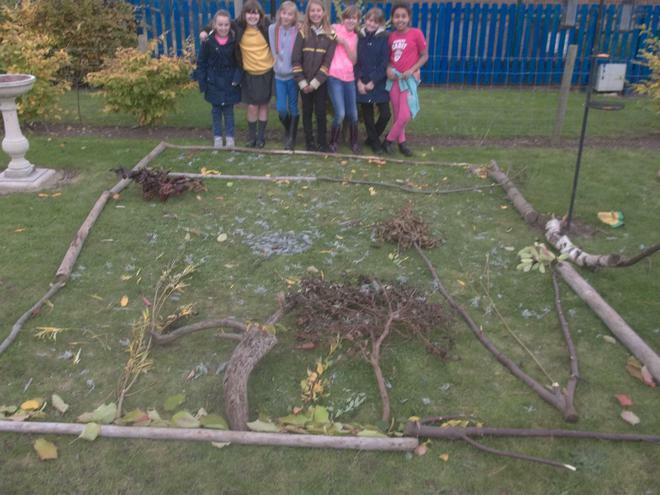 the children have also made 'Rangoli Patterns' using natural materials found in the environment. 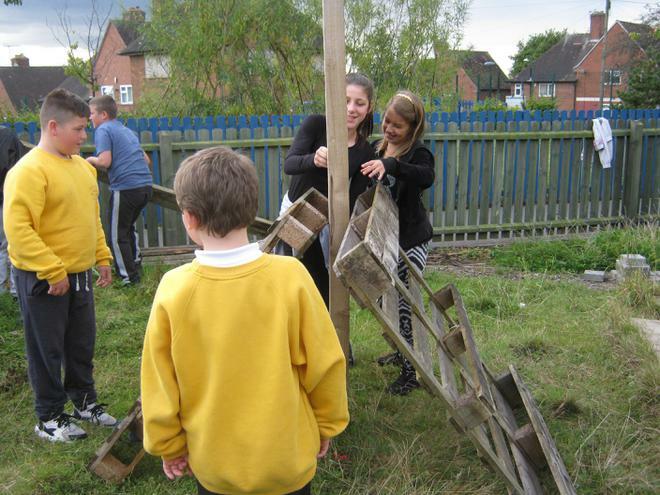 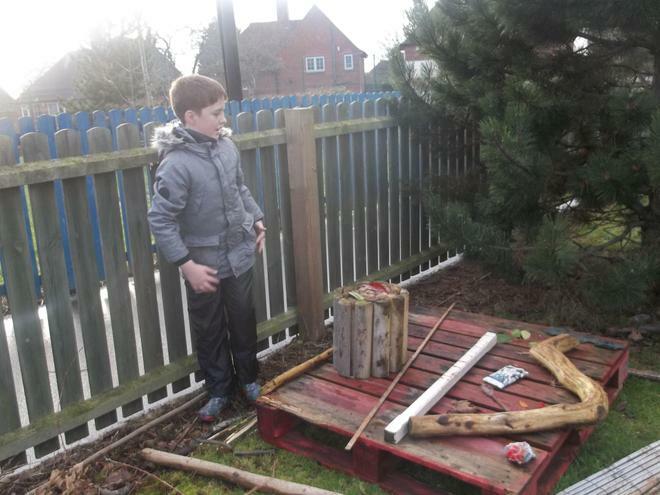 Linking in with their Topic work 'Games and Rides' the children used natural materials to create a fair ground ride.